With approx. 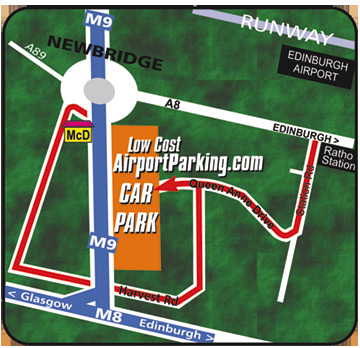 2000 parking spaces in our purpose built carpark at Edinburgh Airport, allows us to give you the customer the best deals in low cost Secure Airport Parking. When booking with us please keep in mind that we are independently owned & operated, your booking comes directly to us, not to a third party booking company who will charge you an additional booking fee. Security Parking at our Airport Carpark for Edinburgh uses modern technology along side good old fashion "on foot" guard dog patrols. Our CCTV which operates 24 hours per day utilises state of the art "Nite-Light" Infrared illumination, this works alongside and in conjunction with our Full Site Flood Lighting. The perimeters of our carparks are surrounded by 10 foot high electrified security fencing. Entrance to our Carparks is via Secure Gate Entrance Barrier and on Exit a unique PIN number is required before leaving, which you receive once you have checked out at reception. Take turnoff for McDonalds (Clifton Hall Road) take 1st left into Harvest Road and go under the bridge and then take 1st left for Ratho Station (Harvest Drive) follow the road around for 400 yds and take 1st left into Queen Anne Drive and pass the Newbridge Bond and the car park entrance is straight ahead. Take the Glasgow road heading for the Newbridge roundabout- just after the walk over bridge take 1st left into Ratho Station -take 2nd right into Harvest Drive and then 1st Right into Queen Anne Drive ( just at Scottish Hydro ) and the car park entrance is straight ahead.